Lottie Bromley and Kitty McLaughlinare are 10 years old, live in Bristol in 1940, and are best friends for ever. Lottie's father is a promising scientist working very hard to understand how time travel works. His research is specially important at this moment, since time travel could be such an important weapon during the war. And of course it can be dangerous too. Kitty, Lottie and her father confirm this when they are kidnapped by Nazi officers who are sure Mr. Bromley has revealed time travel's secret. Just when Lottie and Kitty are going to be shot by the Nazi officers, something absolutely incredible happens, Lottie sees a portal. She knows she is the only one who noticed it, and she has to decide what to do. There's not enough time to take Kitty with her. Lottie decides to go trough the portal, and ends in Sutton, Wisconsin, 2013. A new huge challenge begins for her. She has to adapt to a new life, accept the idea she has lost her family and friends for ever, and live with the guilt of have left her best friend behind. She knows all of these are the consequences of her decision of going through the portal, but there's only one thing she is not going to give up. She will find Kitty. This plan is brought to a completely new level when a card from Kitty reaches Lottie's hands. She will find her friend even if that means travel to a different time and place. This story has action and heart warming moments. Although time travel is a component, it is not the most important of them. That's the reason I'm not labeling it as science fiction. 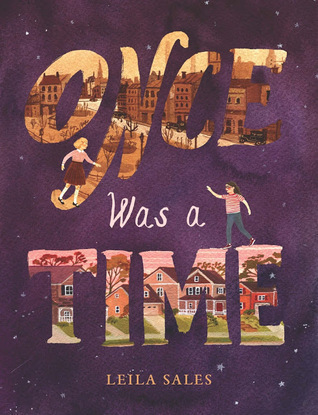 I think the author uses time travel as an excuse to tell a beautiful story about friendship, perseverance and the difficulties of adapting to a new situation after a life changing event. The characters are well traced, and both, Lottie and Kitty, are really easy to relate with. The plot is smartly weaved. Along the book I found many thing that looked like inconsistencies, but everything comes to place at the end. And talking about the end, it deserves its own paragraph. I would say it is a happy ending, but the bittersweet-happy ending type. They exist. Believe me. :) It's a hard task to explain this without giving away spoilers. Let's say it is not the "everything-is-perfect-now" type of ending, but it's a consistent and surprising one, and it makes perfect sense with the whole story. In the overall a great middle grade novel. It's my first book by this author. I know her previous novels are YA, so probably I won't read them (I'm a bad YA reader, sorry), but I'd be interested in future middle grade novels by Sales. And again, don't let the time travel stuff prevent you form picking this story. It's not a science fiction book. I enjoyed this, but I'm interested to see which of my students pick it up. It's definitely "speculative fiction", with the time portals!